Total dollar amount of all card payments processed by sellers using Square, net of refunds. 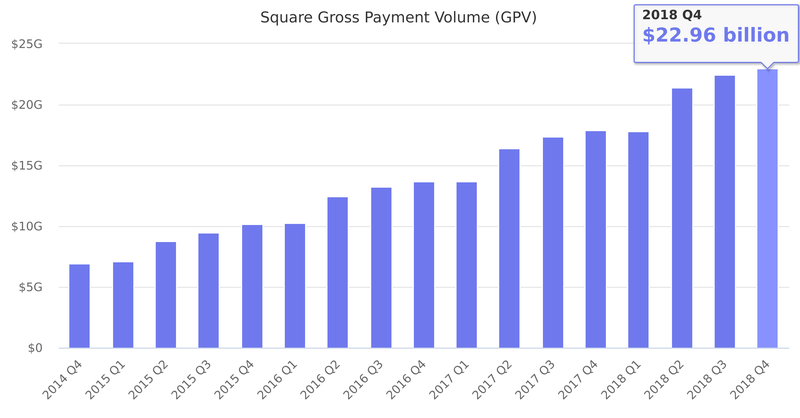 Additionally, GPV includes Square Cash activity related to peer-to-peer payments sent from a credit card and Square Cash for Business. GPV excludes card payments processed for Starbucks. Last reported quarter 2018 Q4 it was $22.96 billion, up by 28% year-over-year from $17.89 billion. From $65.34 billion in 2017 it increased by 30% to $84.66 billion in 2018.